I'm posting this photo for Carmi's Thematic Photographic theme of wood: a wooden rowboat on a sunny winter's day. For another wood photo, see my other blog. Taken December 26, 2006, in Vancouver. I always wonder what makes people name their boats what they do. 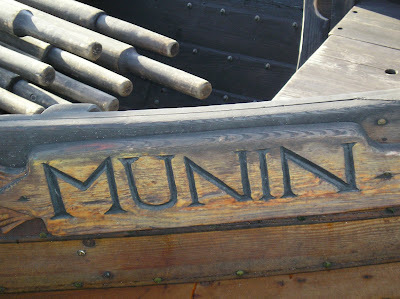 Munin? What does that mean? Was it Aunt Mildred's maiden name? Was it the town their ancestors lived in? Was it the raven of the Norse god king Odin? Was it old computer talk when the owner was a computer geek before he sold everything and vowed to row around the world?